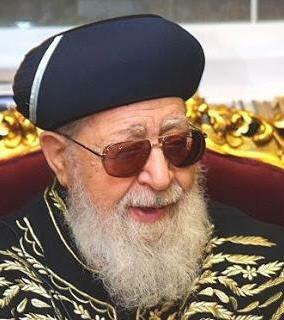 Hakham Obadia (Abdullah) Yosef (24 September 1920 – 3 Heshvan / 7 October 2013), son of Yaaqob and Gorgia Yosef, born in Baghdad, later moving to Jerusalem, was the former Sephardic Chief Rabbi of Tel Aviv (1968-1973) and the State of Israel (1973-1983). A recognized Talmudic scholar and an expert authority on halakha, especially the "Shulhan Arukh," by Maran H Yosef Karo, H Obadia served as the spiritual leader of the Shas political party in the Israeli parliament as well as the spiritual leader of all Sephardic Jews worldwide. A student of H Ezra Attiah at Yeshivat Porat Yosef in Jerusalem, and a peer to H Barukh Ben Haim, H Ben Sion Abba Shaul, and H Sion Levy, H Obadia's genius and talent was evident by all who knew him from a very early age. He is the author of many Halakha responsa, such as "Hazon Obadia," "Yabia Omer," and his opinions (as compiled by his son H Yisshaq Yosef) are recorded in the famous "Yalkut Yosef" series. His children are: Adina, Yaaqob (A"H), Malka, Abraham, Yafa, Yisshaq, Ribqa, Sarah, David, Leah, and Moshe. In 2013, just a few weeks before his passing, his son, Yisshaq Yosef, got elected to the position of Sephardic Chief Rabbi of Israel. Instrumental in "Restoring the Crown of Sephardic Judaism to its Former Glory," his impact was significant for uniting Sephardic Jews all around the world and will never be forgotten.